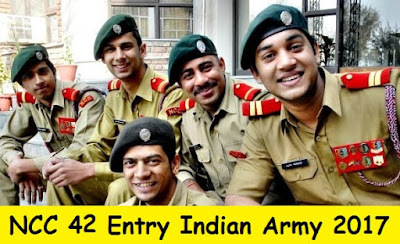 Hello Aspirants, looking for NCC 42 SSB Dates, Center Allotment List have a good news for you soon Indian army will be announcing recruitment for Married/unmarried MALE and unmarried FEMALE candidates and also from Wards of Battle Casualties of Army Personnel who hold NCC C certificate can apply for this entry. Indian Army Recruitment NCC 42 Entry. Eligible and Interested candidates can apply on or before th 2017. Feel free to ask questions below in comments. Age Limit. For NCC candidates (including Wards of Battle Casualties)19 to 25 years (born not earlier than 02 Jan 91 and not later than 01 Jan 97). Age Limit: For NCC candidates (including Wards of Battle Casualties)should be born between age of 19 to 25 years (born not earlier than 02 Jul 91 and not later than 01 Jul 97). 1. Eligible and Interested candidates can apply on plain paper as per the format available at official website of Rtg Dte www.joinindianarmy. nic.in (downloads) , duly typed. 2. Applications should be posted to the nearest OC, NCC Unit from where NCC ‘C’ certificate has been issued. 3. Applications of Candidates serving in the Armed Forces duly counter-signed by Commanding Officer should be sent to the OC, NCC Unit from where NCC’ ‘C’ certificate has been issued. 4. All NCC Units will forward the applications to DDG, NCC of the concerned State. 5. DDG, NCC States will process all applications and forward them to Directorate General NCC. Special emphasis will be laid on the following points: – (i) Check date of birth from class X Certificate. (ii) Check Degree/Provisional degree is from a University recognized by AIU. (iii) Check marks sheets of all years/semesters and ensure that candidate has minimum 50% marks in the aggregate for all three/four years and in case of final year students 50% marks in aggregate for two/three years. (iv) Check NCC ‘C’ Certificate with minimum ‘B’ Grading. 6. Directorate General of Recruiting (Rtg ‘A’), Integrated Headquarters of Ministry of Defence (Army), reserves the right to shortlist applications on the basis of grade obtained by the candidates in NCC ‘C’ certificate examination/percentage of marks in degree examinations. Contact Address :- Tele No (011) 26173215,26175473 (between 2 PM to 5 PM Monday to Friday) Address:- Directorate General of Recruiting, AG’s Branch, IHQ of MoD (Army), West Block –III, RK Puram, New Delhi-110066. This was all about NCC 42 SSB Dates, Center Allotment List . Eligible and Interested Candidates can apply online for the NCC entry 2017 from the Indian army official website. Candidates can also subscribe us to get all latest updates direct to email I'd or can follow us on Facebook for latest notifications. Feel free to ask below in comments regarding NCC 42 SSB Dates, Center Allotment List. When will the 42nd entry notification be out?